Two of the most common forms of gum disease are Gingivitis and Periodontitis. It occurs commonly amongst humans (and animals for that matter). Around 80% of humans have some form of gum disease – mild to severe. Gingivitis is the first stage of gum disease. Gingivitis is the inflammation of the soft tissue around the teeth, but the bone around the teeth is not affected. Gingivitis can be cured without leaving permanent damage to the gum tissue. Periodontitis can develop if gingivitis is not treated. 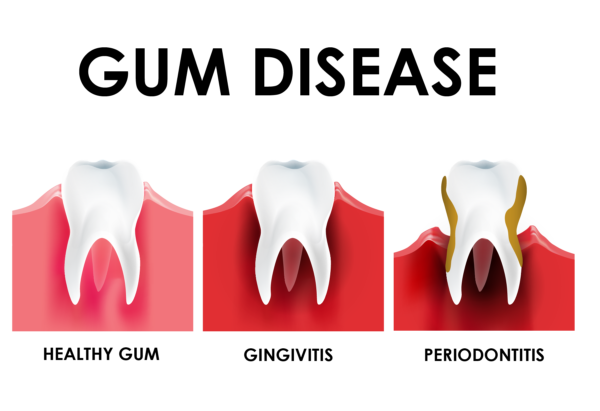 Periodontitis is the inflammation of the soft tissue around the teeth as well as loss of the supporting structure (bone) around the teeth. The progression of Periodontitis can be arrested and the condition can be maintained but leaves irreversible damage to the supporting bone around the teeth. If Periodontitis is not treated, the continuous bone loss will lead to mobility of the teeth. The end result is obviously tooth loss. Historically and even today, most people that have lost their teeth, have lost them because of gum disease (Periodontitis) and not decay, as commonly thought. Everybody has bacteria in their mouths. It is called oral flora. Oral flora consists of the so-called good and bad bacteria. As long as there is a balance between the good and the bad bacteria, the disease will not occur. But when an imbalance occurs, production of acidic compounds by the microorganisms can cause damage to the teeth and gums. For this reason, we brush our teeth twice a day and floss at least once a day (or use another form of cleaning in between the teeth). Gingivitis can be recognized by red, swollen gums that bleed easily when you brush your teeth. Advanced stage of gingivitis can be painful, but early onset of gingivitis is not necessarily painful. To treat gingivitis, you need to remove the plaque (bacteria) and calculus (calcified plaque) on the teeth and underneath the gums. This cannot be done with your toothbrush anymore, and an oral hygienist or dentist needs to assist you with their specialized instruments. Proper oral hygiene instructions need to be given to the patient to prevent reoccurrence. Gingivitis cannot be cured by simply rinsing with a mouth rinse. The cause of the inflammation (plaque and calculus) needs to be removed first. It will take a couple of days before the inflammation is gone and the gums are healed. To speed up the healing process, a specialized mouth rinse, like Andolex C can be used. Long-term use of a specialized mouth rinse is not recommended. Most specialized rinses contain Chlorhexidine that will interact with things like coffee and tea and can cause staining if used over long periods of time. Having a professional dental cleaning by your oral hygienist every 6 months, and daily flossing (or other forms of cleaning in between the teeth) and bushing of your teeth twice daily, can greatly reduce your chances of developing gingivitis. Depending on your existing state of oral health and how rapidly plaque forms and calcified, your oral hygienist might suggest a different oral hygiene regime. This might include specialized products and/or cleaning aids to use and to have more frequent professional visits. All depending on each individual. Unlike Gingivitis, Periodontitis takes years to develop. One of the dangers of Periodontitis is the fact that it is not necessarily painful. Therefore, a person can have periodontitis already, and not seek help. This reduces the chances of early invention and treatment. If Periodontitis can be treated in the early stages, the risk of losing teeth is much smaller. Like with Gingivitis, the plaque that is left on the teeth for long periods of time will extend underneath the gums. It will get calcified by the calcium and minerals in your saliva. After calcification, it will not be possible to be removed with a toothbrush. Unfortunately, the bacteria keep growing and the already rough surface of the existing calculus will give the new plaque an even better surface to hold on to. While the plaque keeps growing and continues to extend deeper into the gums, the bone around the teeth is resorbed. In a healthy dentition, there is a natural space of 1-2mm between the tooth and gum around the teeth. This makes it easy for you to clean with floss around the teeth and into this natural space of 1-2mm. This space is called a sulcus. When you have periodontitis, and loss of bone has already occurred, this space increase in depth, and we call it a periodontal pocket. Because of the depth of some of these pockets (severity of disease will increase the depth of the pocket), it is not possible to successfully clean this space. This means bacteria are left undisturbed inside the bottom of this pocket that will promote disease development. For this reason, it is so much easier to arrest the disease process if it is diagnosed in the early stages. Treatment by your oral hygienist, or if the disease is very advanced already, by a periodontist, is needed. Treatment will include cleaning of these periodontal pockets to try and arrest the disease process. Maintenance visits for professional cleanings will be more frequent. In most cases every 3 months, unless otherwise decided by your oral hygienist or periodontist. Bleeding gums caused by plaque and calculus on the teeth and underneath the gums is one of the major reasons for bad breath. By brushing alone, we only remove about 60% of plaque. Interdental care in the form of flossing, interdental brushes or water irrigation is needed to remove the other 40% of plaque that forms in between the teeth and underneath the gums. It is important to understand that plaque forms on hard tissue (teeth), soft tissue (tongue and gums) as well as on artificial surfaces likes crowns, implants and dentures. Implants and teeth underneath crowns run the same risk of disease if not cleaned properly. Name and business address of applicant: iNova Pharmaceuticals (Pty) Limited. Co. Reg. No.1952/001640/07, 15E Riley Road, Bedfordview. Tel. No. 011 087 0000. www.inovapharma.co.za. For full prescribing information, refer to the individual package inserts as approved by the Medicines Control Council (MCC). Further information is available on request from iNova Pharmaceuticals.